Mill Rose Inn Bed and Breakfast - Hej Doll | Simple modern living by Jessica Doll. I’ve never stayed at a Bed and Breakfast before, but have always wanted to. I know so many people that rave about them, and my first experience at one was along the same lines. When the Mill Rose Inn offered to host us for a night, I was beyond thrilled. 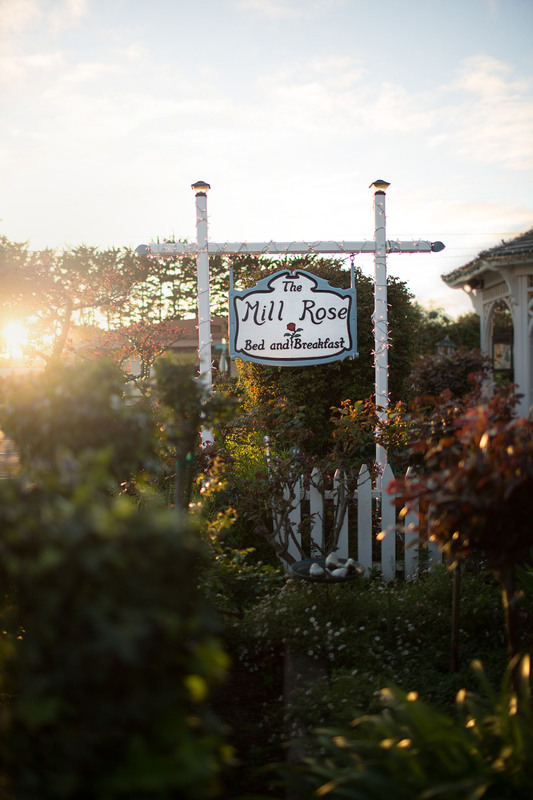 The Mill Rose Inn Bed and Breakfast in Half Moon Bay, California is a quaint little place nestled a block away from the downtown area. I normally travel alone or with my immediate family, but on this trip I decided to bring my Grandfather along. I feel like my draw to travel was very strongly inspired by the trips that my grandparents took me on as a child and wanted to repay the favor in a way. When we arrived, we received a very warm welcome, and then given a tour of the property. It became evident very quickly that Eve and Terry, the innkeepers, were not only kind and wonderful individuals, but that they have a passion for crafting the perfect stay down to every detail. I felt as if they were welcoming me into their home, and The room we stayed in was the Renaissance Rose Suite, which I believe is one of the largest on the property. There was an entryway, a full bathroom, a large sitting room, and a bedroom. Every detail of the Mill Rose Inn was meticulously planned and executed with a level of intention that even I envy. The variations in wallpaper perfectly complimented one another, right down to perfect placement of the seams. The antique wardrobes and furniture throughout the hotel has only improved with age, like a fine wine. Everything has been cared for and loved with a passion you can really sense. Eve spent a good amount of time telling me about the area, and really getting to know me. If I’m playing favorites, I really enjoyed the garden area. Eve has done such a wonderful job with the english-style garden, you can feel the love and care that has gone into taking care of the inn. It wasn’t in it’s peak blooming state during our stay, so I’d love to return at a time when it is. All-in-all our stay was absolutely wonderful, and felt like a step back in time without the loss of modern amenities (hello, decent wifi!). I hope to return sometime to experience the Mill Rose Inn again with my husband or as a family. I LOVE a cute B& B! This place seems off the beaten path, so I love it!! Now that I think about it, I’ve never stayed in one neither. I think I need to change that because there are so many cute ones out there!